TQ 14 Custom Jewelry by Ginger, originally uploaded by gingersnaps. 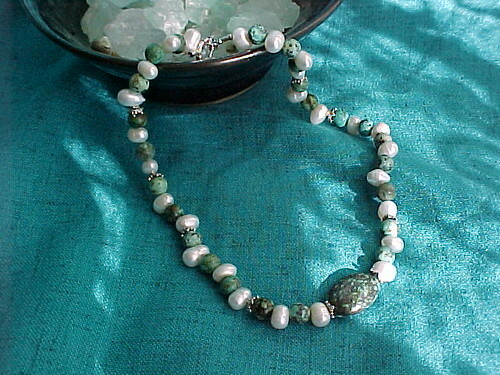 Turquoise nuggets, Freshwater Pearls, Bali sterling silver & a sterling silver toggle clasp. 17" long. $98.85. This necklace is very stunning. GREAT CHRISTMAS PRESENT. C11 Sig, originally uploaded by gingersnaps. These jewelry designs are by Ginger of www.anointedjewelry.com. This is one of my signature pieces called "Resurrection". It is made of gold vermeil beads, crystals, plated spacers and a sterling silver gothic cross. 16" long with a 2" ss extension chain. This lovely necklace is $50. & $15. for matching earrings. BLESSINGS. WO 38N & E, originally uploaded by gingersnaps. CHRISTMAS IS UPON US! Jewelry designs by Ginger @ www.anointedjewelry.com. Don't you need this lovely necklace made up of a Ruby Zoisite drop, two sizes of Ruby Zoisite rounds, Garnets & Bali sterling silver. That special person in your life would like something like this. Necklace is $71. & Earrings $15. See more designs @ www.flickr.com/photos/gingersnaps . Look at the "Christmas Clearence" and more new jewelry designs "My Jewelry Designs". Blessings. W777, originally uploaded by gingersnaps. CHRISTMAS SPECIAL 50% OFF NECKLACE. Green glass brioletts with baby blue delica beads. This lovely necklace is $16.75 sale price. Blessings. WO 17, originally uploaded by gingersnaps. CHRISTMAS SPECIAL 50% OFF SET. Smokey Topez, Tigers Eye, cream colored Jasper & Bali sterling silver.16" long with a 2" sterling silver extension chain. Necklace $22.25 & Earrings $7.50. This is the sale price. Many other items on sale @ www.fickr.com/photos/gingersnaps see flickr "Christmas Clearence" & other new items not on sale under "My Jewelry Desings". Blessings. C05.EC05-, originally uploaded by gingersnaps. CHRISTMAS SPECIAL 50% OFF THIS SET. Chalcedony, Iolite, blue Topaz, crystals & a sterling silver fancy cross. 16" long with a 2" sterling silver extension chain. Necklace $22.50 & Earrings $6.50 this is the sale price. Blessings. www.anointedjewelry.com CHRISTMAS SPECIAL 50% NECKLACE. Custom made jewelry. Turquoise chips with a sterling silver cross with turquoise. Necklace$41.50 this is the sale price. Blessings. WO 35, originally uploaded by gingersnaps. 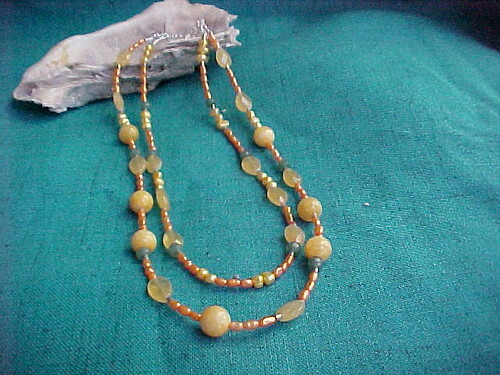 This lovely custom piece of jewelry is designed and made by Ginger www.anointedjewelry.com .This is a double strand necklace with oval Jade, Jade Serpentine, rondel Aventurine, yellow & orange rice pearls. 16"s long with a sterling silver clasp. The necklace is $99.00. This is one of my favorite necklaces because of all the colors in it. B 2, originally uploaded by gingersnaps. 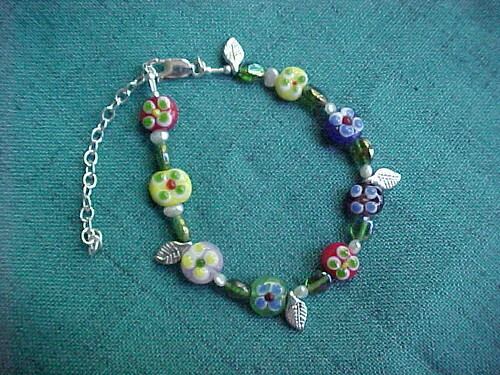 Bracelet: This is made of glass painted flowers, green glass beads, pearls & sterling silver leaves. There is a 2" ss extension chain. $37.50. WO 37 Amathyst, originally uploaded by gingersnaps.